I knew that he did it หรือ I am afraid that you are right. =I knew he did it. = I am afraid you are right. I don’t know what I should do. = I don’t know what to do. คน Prep. O Prep. 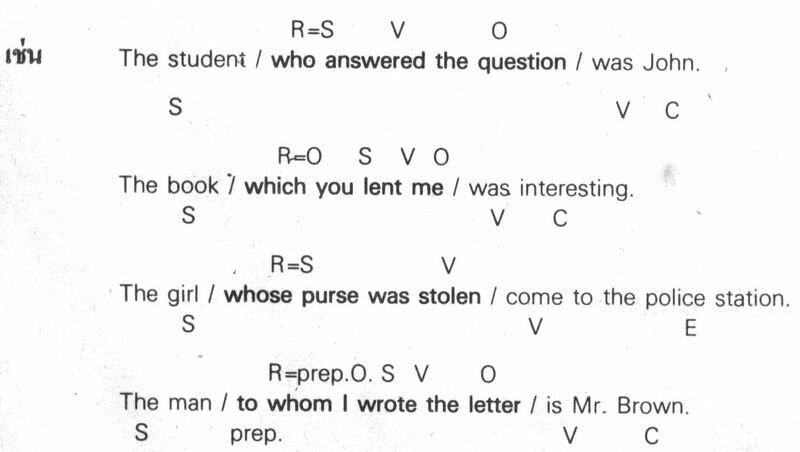 Whom, (that)…prep. สัตว์,สิ่งของ Prep. O Prep. Which, (that)..prep. 1. 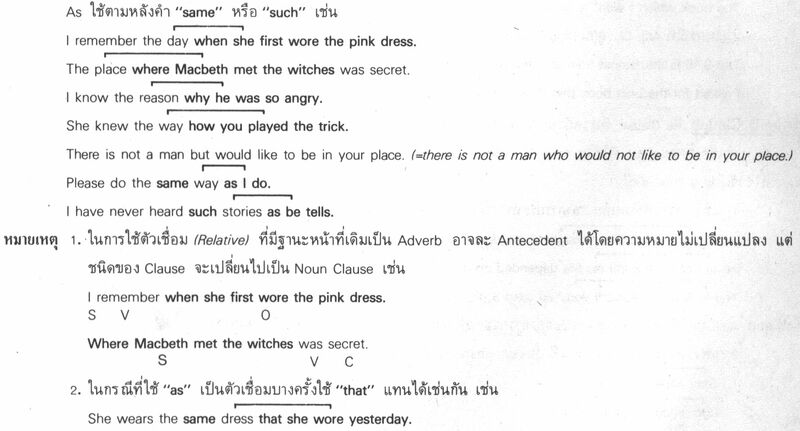 Adjective Clause ในกรณีที่ตัวเชื่อมมีหน้าที่เป็นกรรมของบุพบทนั้น สามารถเขียนได้อีกอย่างหนึ่งโดยการวางคำถามตำแหน่งเดิม คือ The man whom I wrote the letter to is Mr. Brown. She is the most beautiful girl that I have ever seen. 2. 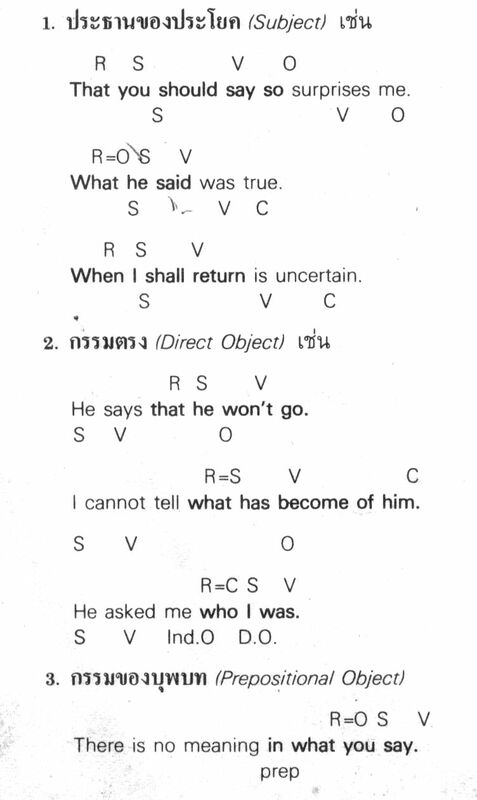 เมื่อ Antecedent เป็นคำเหล่านี้ all, any, none, nothing, (the) only Man is the only animal that can talk. Who am I that he should object? What is it that troubles you so much? The boy and his dog that broke into my house were caught this morning. Bernard Shaw, who wrote St.Joan, died in 1950. The Golden Hind – in which Drake sailed round the world – was only a small ship. That scientist (whose work is very important) has been made a knight. The 9:15 is the fastest train that there is to Oxford. = The 9:15 is the fastest train there is to Oxford. I asked for the best book that there was on the subject. = I asked for the best book there was on the subject. I learned a lot of French while I was in Paris. She learned English before she came to England. He kept on with his work until he had finished it. The thief was arrested as he was leaving the bank. Since/as/seeing that/now that you won’t help me, I must do the job myself. He sold the car because it was too small. It was (only) because the car was so small that he sold it. Though (although) he tried hard, he was not successful. For all that he tried hard, he was…………………………. Whether he tried hard or not, he was……………………. Whenever he tried hard, he was…………………………. However hard he tried, he was………………………….. 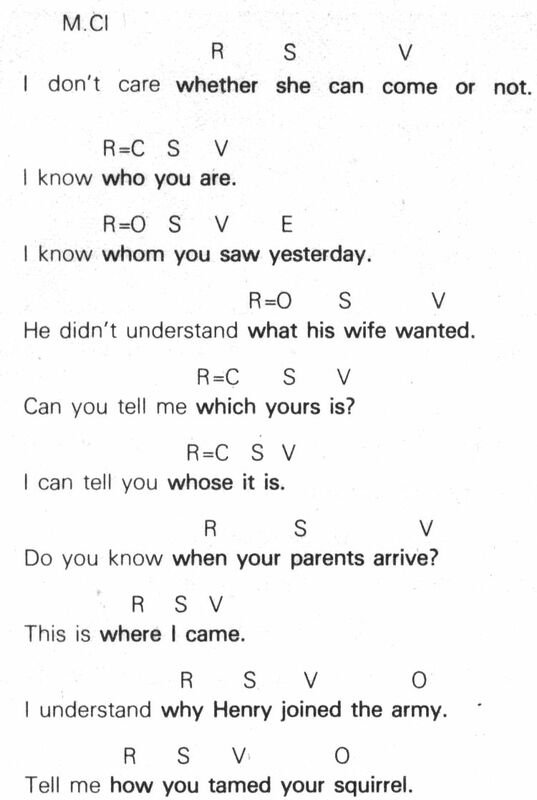 This work is as easy as you think. I can not run so fast as you used to do. That question was not such an easy one as I thought. I used to love you more than he does now. The more you eat, the bigger you become. I shall go if he asks me. I shan’t go unless he asks me. Some people eat so that they may live. Others seem to live in order that they may eat. I am telling you this lest you should make a mistake. I received my wages yesterday so that I can pay what I owe you. He ran so fast that I could not catch him. It was such a warm day that I take off my jacket. Though he was beaten, he was not disgraced. = Though beaten, he was not disgraced. While he was walking in the park, he sprained his foot. = While walking in the park, he sprained his foot. Whether it is right or wrong, his opinion does not concern me = Whether (being) right or wrong, his opinion does not concern me. If you take this medicine regularly, you will be better. = If taking this medicine regularly, you will be better.